It's plush ambiance and a welcome with the fragrance of fresh jasmine flowers leads you to a heaven of soulful food with authentic Indian flavors. They serve a set menu buffet with varied options to suit everyone. Indeed, there is a little bit of something for everyone to eat. In starters, Gosht Galawat is the best for meat lovers and so is the Murgh Nizami Tikka. Lemon Garlic Grill Fish is something which you would definitely like to repeat. 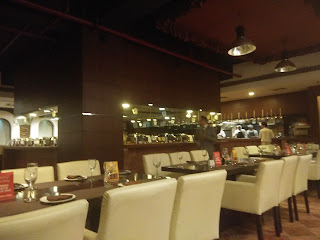 Before starting off the main course, I would recommend their DIY Papri Chaat, where you can prepare the all time favorite chaat according to your taste. Also, the buffet has some great live counters which I suggest one should definitely try. One of them is of Tawa Chicken which was yum. In desserts, they make fresh Jalebi at a live counter which is a must try. The Paan Ice cream at IGR is a specialty and is basically your tutti frutti kind of ice cream loaded with Paan flavors. This was the first time that I tried Pineapple Halwa which was loads of Khoya, Pineapple, and sugar merging together to make a great Halwa. A warm and inviting place, ideally suited for family dinners to enjoy a lavish meal and hearty conversations.